NEW! Shellfish Pot Regulations Video for Southeast! In Alaska, "Personal use" is a legally defined regulatory category of fishery. It is defined as "the taking, fishing for, or possession of finfish, shellfish, or other fishery resources, by Alaska residents for personal use and not for sale or barter, with gill or dip net, seine, fish wheel, long line, or other means defined by the Board of Fisheries." 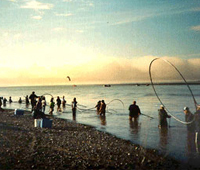 Personal use fishing is open to Alaskan residents only, and you must have a valid resident Sport Fishing License to participate in personal use fisheries. The bag, possession, and gear limits in personal use fisheries MAY NOT be added to the bag, possession, and gear limits under sport or subsistence regulations. It is unlawful to buy, sell, trade or barter personal use finfish, shellfish, aquatic plants, or their parts. Many, but not all, personal use fisheries require a permit issued by the Department of Fish and Game. Personal use fisheries have many different regulations for bag limits, allowable gear, and time and area restrictions. Some personal use fisheries are managed in-season by emergency order, so regulations can change at any time. Always check with the local Fish and Game office before participating in personal use fisheries.